We’ve been hot on GIGL’s trail since tagging it in Friday’s premarket report, after catching it come off of a bottom. As of the end of that session, we’d witnessed a move of more than 350% from our observed low of .0053, to a high of .024, which occurred on record volume. With the stock closing strongly at .035, we will of course be continuing to monitor its activity as we progress through the week. We also tagged ACNV in yesterday’s morning report, and were pleased with the magnitude of the possible gains that were available there. The stock traded in a range from .008 and managed to hit .015. That was the second subpenny play in as many days to crack the penny barrier on our watch (GIGL being the other), and it was good for intraday gains of up to 88% A strong close on healthy volume warrants further tracking in this instance as well. On the 16th of last month, we formulated an extended-term options idea for LLY, and this morning, we’d like to take a second to update our readers on the level of gains that call has attained in recent weeks. We’ve got one last update this morning for MYHI. Last Wednesday, we tagged this stock, along with a varied group of several legal and medical marijuana plays, and just wanted to circle back to go over the fact that it has followed our expectations to the letter. After the huge initial move we witnessed from .09-.239 (+166%) that first day, we followed up with an added caution, explicitly stating that “we expect a consolidation that should lead to a dip-and-rip pattern”. That is exactly what has come to pass, as MYHI consolidated back to a low of .0909, before launching back to .175 yesterday. The move afforded us a chance to realize further gains to the tune of 93% on the rebound. Along with MYHI, we’ll continue to watch several cannabis stocks, which comprise the vast majority of today’s extended watchlist. Good Morning Traders, and Happy New Year! We hope everyone had a pleasant holiday season, but now that the new year has begun, we also hope everyone’s ready to dive right back in and take 2017 by the horns! We’re looking forward to another year of market action and tracking hot plays whether they be pennies, big boards, options, or whatever! Wherever we see even the slightest chance for a big opportunity we’ll be there, so join us- the 2017 trading year starts now! We’ve been all over the cannabis space for years, but the scope and intensity of our observation has been decidedly more focused in past weeks and months. On Sunday, legalized recreational marijuana took effect in California and elsewhere, so you can all expect that the pot sector will be an area of continued interest as the industry as a whole is set to undergo huge growth and change in coming months. We had a few reminders appear in Friday’s premarket report from among the vast group of pot plays we’ve tracked over an extremely long period at this point. PHOT and VAPE, two old favorites, both followed that up with solid intraday performances to close out 2016. Oceanic Research & Recovery Inc. ORRV - We began mentioning ORRV on Wednesday, and subsequently would witness a low of .0005. 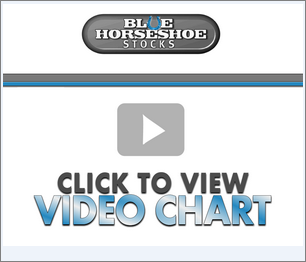 Friday the stock posted a huge finish to the year, running up to a new high of .00271. That marked a three-session swing of 442% We’re going to be keeping an eye peeled for the possibility of continued momentum. ERF Wireless, Inc. ERFB – Our first tag of ERFB came three Friday’s ago, at which time we would observe a low of .0013. It too broke out to new high on Friday, reaching .02. From our initial low that works out to an overall increase of 54% More gains could be on the horizon in this case as well, so we’ll be watching. 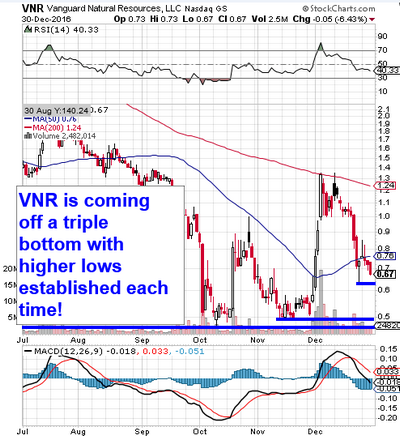 We also want to put VNR on our radars as we kick things off on this short week. We’ve included a snapshot below and as you can see, a triple-bottom formation is currently in effect. We are going to be watching for a reversal, which, if the last couple of cycles are any indicator, could lead to a pretty significant PPS increase. With the markets as a whole appearing to want to open up 2017 on a high note, we’re going to signal a range of bullish options calls for the SVXY ETF. We’ll be monitoring the SVXY Weekly $93.50-95.50 Calls. On Wednesday, we were mentioning ORRV, and how we’d seen it make a nice move after discussing it in our traders chat the day before. We hinted at the possibility of seeing further gains from this volatile mover, and yesterday provided a truly excellent opportunity to make some fast money, just as we’d hoped. ORRV traded as low as .0005 in the morning before ripping its way to a daily high of .0022, which marks a single-session run of 340% so congratulations to anyone who noticed our alert and reaped the benefits. Moving forward we’ll treat this play like any other that has been making solid strides to the upside, looking for it to maintain its uptrend with higher highs and higher lows. NVidia Corp. NVDA - This has been 2016′s top performer on the S&P 500, and one that we’ve visited in our reports on occasion. Despite already being up over 200% on the year, we like the feel of the reversal that occurred yesterday after it previously had appeared that a downturn was setting up. Instead shares of NVDA pressed upward, and the stock is gapping up considerably in premarket trading today. We’re going to focus upon the NVDA Weekly $112-115 Calls to try to turn a quick profit today. Advanced Micro Devices, Inc. AMD – We also want to look at one of NVDA’s direct competitors, which has also been building momentum on the chart, in a general uptrend since the middle of October. Here we’re going to want to monitor the activity in the AMD Weekly $11-12 Calls. CAUTION: Never trade weekly options contracts on a Friday if you aren’t an expert trader. These are high-risk/high-reward style plays that are not for the faint of heart, or the inexperienced! Focusing on NVDA Friday morning on the heels of its earnings beat turned out to be a fantastic idea. It was a great way to cap off a week filled with solid options trading ideas. The stock itself made an incredible intraday run of nearly 30% and as a result, our specific area of interest, the NVDA Weekly $77-80 Calls, yielded some great chances for huge single-session profits. That included nothing less than 201% and one that even went for a ten bagger! Congrats are due to any of our readers who used our hunch to help bank a piece of these serious profits! We also want to provide an update on cannabis stocks, which we promised to continue following on the heels of legalization happening in three states last week. We’ve done so in the form of a quick video review of some of the more high profile plays, like MJNA, CBIS, PHOT, GRNH, and NEWC. After a pullback around election time, pot stocks in general began to gain steam again at the end of the week. We’ll be watching carefully for the recording of higher lows and higher highs across the board. We also want to take heed of a bottom-watch play we’ve identified this morning. 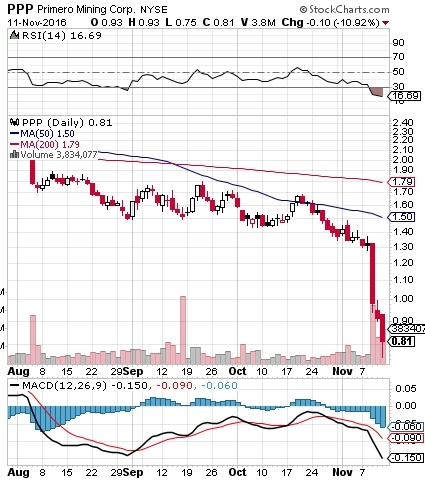 PPP reached new 52-week lows on Friday, after a disappointing earnings release earlier in the week sent the stock into a tailspin. We’re always looking for bargains, and to find one in a gold play in the midst of a solid run-up for the precious metal, has the potential to be especially fortuitous. As a quick glance on the chart below will show, the stock is presently heavily oversold and searching for an ultimate low here. We’ll want to be ready to strike when the reversal occurs.